For a vacation fully immersed in nature and culture, this region of Italy offers a lot of excursion possibilities: walking tours, cycling, horseback riding, boat excursions, museums and, of course, the architectural beauties. The most important attractions are the Comacchio Valleys, the Po Delta Park, the famous Trepponti bridge in Comacchio, the ancient abbey at Pomposa, the Museum of the Roman Ship in Comacchio and the former house of the famous artist Remo Brindisi in Lido di Spina. 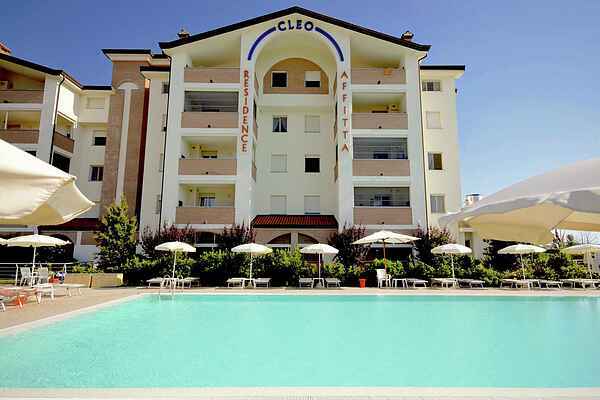 The strategical position of Residence Cleo makes it easy to visit the most famous and beautiful cities of Italy in only a few hours time: Ravenna, Ferrara, Bologna, Rimini, Venice, Rom, Florence. Young people and sport fans can practice a lot of sports in the direct surroundings, such as swimming, sailing, Nordic walking, cycling, golf, tennis, fishing, and to really stay in shape: jogging at the beach. The many clubs and bars on the beach will entertain you all night long! Of course we are not forgetting the little ones! In the centre of the village you’ll find the fun fair, on the beach animation teams and miniclub and at only a 30 minute drive you’ll reach several theme parks such as Mirabilandia, Fiabilandia, Italy in miniature and the Safari park!